I had some time this morning to photograph my newly finished Anzac Coat. If you followed the Ready-To-Wear Tailoring Sewalong, you’ll know this coat inside out – literally! And if you are sick of the sight of it – I promise this is the last post. Oh dear, is that a pun?! I’d like to wear it with boots, but I haven’t replaced my old ones yet. It seems to be flat-or-casual-boots-only season this year. So I’ll have to settle for some sixties style kitten heels for now. I even tried Casey’s awesome tutorial for a 60’s casual hairdo that she posted today, but it was a far-flung dream on my hair. This is what my hair looks like half an hour after some vigorous backcombing – what a waste of time! I was tossing up between antique pewter or brass buttons, either would have worked but I chose brass, using 36L for the front and 32L for the epaulettes and back belt. It looks OK worn unbuttoned too, or maybe a bit studenty? Taking self-portraits is a great way to have a good laugh at yourself! The remote release was being a bit temperamental and making me that way too – this is what I look like when I am cross! The back view, with the half belt I added to conceal the seam that I inserted so I could cut all the panels I needed from the remnants of cloth! I will make the belt a bit shorter as the ends knock against my arms when I walk – at the moment the buttons are placed on the princess seam and the belt overlaps it, I might need to line it up with the princess seam. Overall I am really happy with it and I’ve already worn it a few times – it’s winter here now! Now – what shall I make next….. I saw some awesome fabric the other day, and I’m still plotting ideas in my head, so I can have an excuse to buy it! And what are you planning? Fantastic Sherry, can't wait to finish mine! Thanks again for your wonderfully detailed tutorials, they are great… I'm about half way. Thank you so much for doing such excellent tutorials. Gorgeous! You did a fantastic job on that! What a wonderful coat! Your tutorials are brilliant. I just want to say “Wow” that coat is perfect and shows off both your fitting and sewing skills so well. The sleeve lehgth is so precise too. Of course you've now set the bar very high………! Very well done. It looks amazing, and you did an a superb job. Congratulations on such a wonderful result! Perfect! You did a splendid job. I am in between projects right now, and not really sure what I want to make next. It's summer here (almost) so probably summer tops. looks great – love the shape. I haven't made many double breasted jackets or coats but you have inspired me to try another one next fall. Your coat looks fantastic! Mine may be finished today and I can't thank you enough for this tutorial! One of my favorite parts was sewing the lining sleeve end to outer sleeve and when it turned, the hem was perfect. I was wondering how I was going to figure out the amount, but it was done already in the preparation with the patterns. I will post my photos by the end of the week. Great coat and I look forward to seeing your new projects. Gorgeous! Am looking forward to following your tutorials when I tackle my next winter coat. Very nice, you will enjoy that coat for years to come. 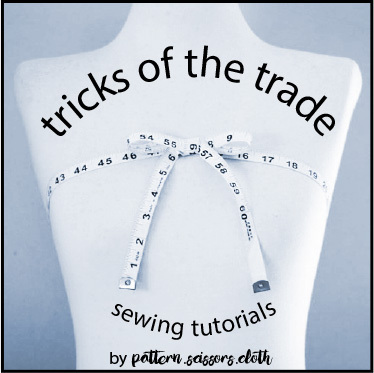 It's so professional looking, you are truly a top notched seamstress/designer and tailor. I always marvel at your creations. What a beautiful coat. I am so glad the weather is turning on its cool charm so you can make the most of it! I, too, saw Casey's '60s 'do tute and will be sharing a comment like this with her. If you girls will set the crown section of hair in rollers, the part you want to tease, and when cool, instead of back-combing, back brush the section instead, you'll have a beehive as big as you like! That is a really pretty and classic coat. You will probably wear it forever! It's been really great seeing all the details along the way and I haven't gotten sick of it. 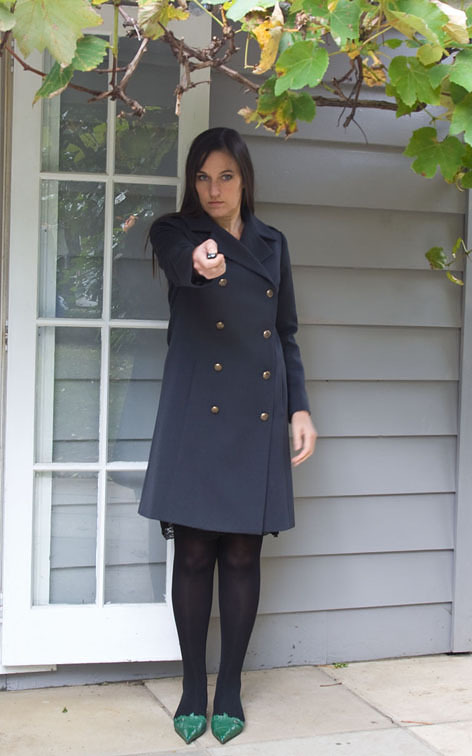 …I love your remote switch pic–like straight out of a spy movie. I'm a buttonhole away from being done with my jacket but preoccupied with work right now so it's taking like 10 days to get to one buttonhole! Great job! I am seriously impressed! Oh, wow! It is absolutely perfect. 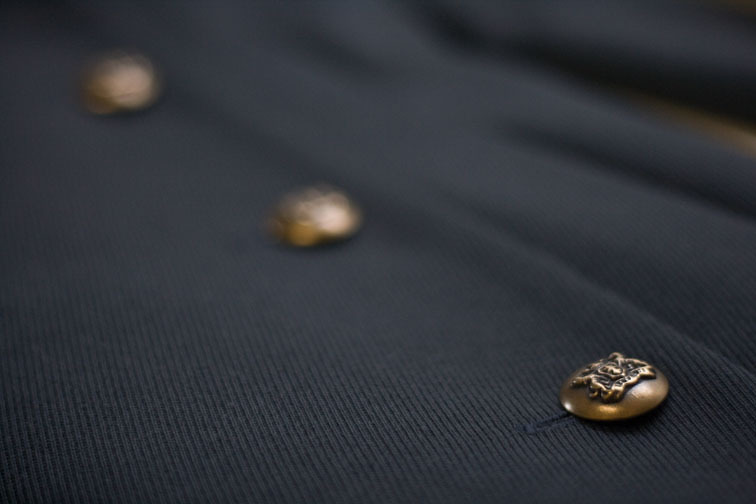 The brass buttons are great. I feel you on the backcombing. My hair must be like yours- fine and straight as a pin. I can put a curl in my hair and it's fallen out in about five minutes. Gorgeous and very classy! 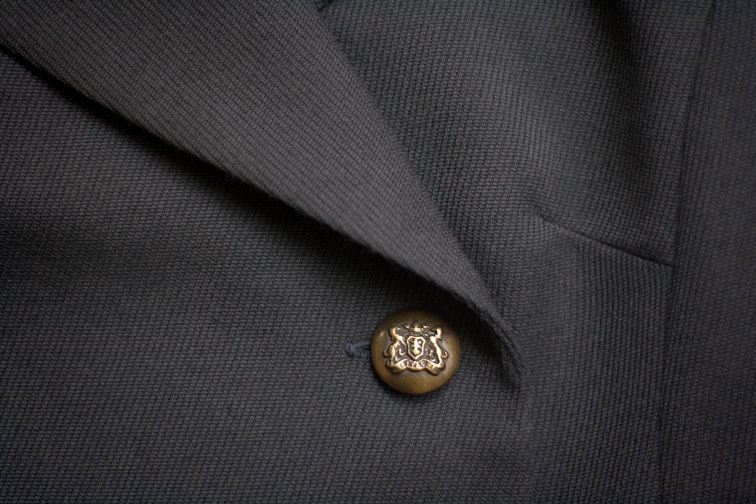 I love the brass buttons against the gray; this way it'll look good with warm and cool tones – everything really. Thanks again for the amazing tutorials. For the first time, my jackets came out feeling “right” rather than too stiff or heavy. How cool is it to see all the different projects spawned by your sewalong? Your coat is super cool. …. the last post … very good! 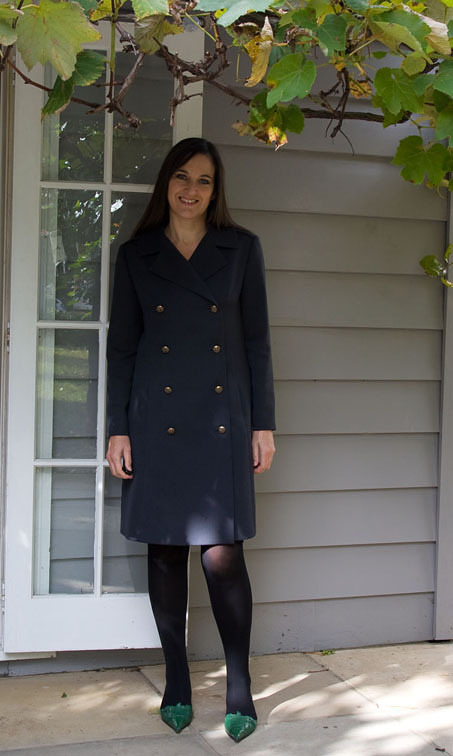 Beautiful coat – it looks much darker than I thought it was from the SAL…. WOW – it is amazing – I like the little belt at the back. I've cut out some Ponte Knit for Black pants – very plain – but super easy. That is one amazing coat – thanks so much for all your hard work explaining things. Mine will be finished today!! but I must admit have had an issue with the hem – so taking my time to do this right. 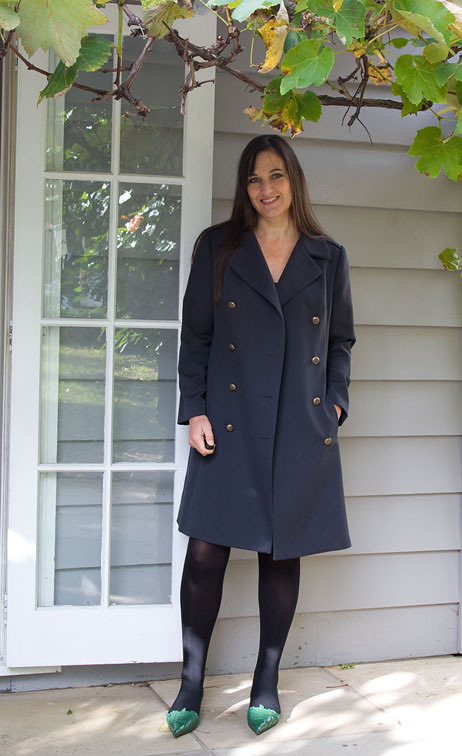 Your coat is stunning and thank you so much for all your wonderful notes on the RTW Sew-along, I will get there. First class coat! I love the green shoes. Sherry, thank you so much for this sew-along. I didn't have time to sew a coat, but I followed every single post and learnt so much from you!!! And your coat looks great! Looking forward to your next projects! I really like your choice of coat it's beautiful and the buttons work so well. I missed the sew-along but will definately join in with the next one. I've been following your coat progress and must say this is one awesome coat. You did such a wonderful job. The fabric, fit, color etc, just great! Oh, I luv those green shoes. Thank you for sharing!!! You have done a superb job in making this fabulous coat. I love the style – every little detail is perfect – and you look wonderful in it. I am sure that this beautiful garment will last you for many, many years. WOW, what a beautiful result. Perfect in every way. There was not enough time in the past weeks to read all your posts, but I'm very happy you have done this and gathered all the links in a separate page on your blog. Thank you for doing these tutorials. What an amazing coat. I love it. It's so elegant! Your coat looks fabulous. Such a wonderful job. I've just finished a coat. I used your collar tips which were wonderful. I've also spent today following your instructions on making jet pockets with flaps for a vest. Thank you so much for taking the time to share your wonderful knowledge. As always a beautiful garment. Thank you again also for sharing your knowledge – there is a coat in my future and I've bookmarked your sewalong for then. Your coat is pure perfection! and gorgeous to look at! I'm actually taking a break right now from working on the boyfriend jacket I should have been working on with you and all the others during the SAL. Better late than never. Thanks again Sherry.